B) Nobody in the area was getting much (if any) training miles in. So with this in mind, the new course was cobbled together at the last minute, and put on a fast track to get RUSA approval (special thanks to Dan Wallace at RUSA-HQ for expediting this!). Organizer Bill Olsen completed yet another R-12 series with this ride (how many is that, Bill?!) ... well done! First finisher, John Fuoco writes: "...I wanted to thank you, Bill, and Don for putting on yesterdays 200k. It turned out to be an excellent route selection, sparing us icy roads yet affording wide shoulders on the busier roads chosen. It was not a heavy traffic day and drivers were courteous. The added bonus was that the course was easy! I know that must sadden you but I'm sure you'll be able to compensate for this one shortcoming in future events. 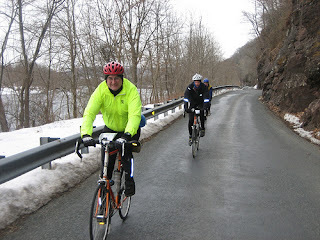 I wouldn't mind revisiting this route in warmer weather when I'm in better shape..."
And fellow first finisher George Metzler writes: "...I think the route choices that you made were excellent for a mid-February brevet in Northeastern PA and northern Jersey. While the routing was far from the typical tough as nails PA Rando event, it gave us a chance to get a safe ride in with snow and ice just inches away from my wheels all day. I’m also not complaining about the lack of climbing either, my riding companions John Fuoco and Jon Levitt figured you must have been twitching as you laid out a route so easy on the knees with all those good climbs available just off of Rt 519..."
Shane Beake writes: "...Nice early season ride today, definitely not your hardest course, in fact it might of been your easiest, which was ok with me and I think some others.Mother nature must of known this and thrown in the wind just to make sure we didn't have it to easy..."
Ixsa Golliur writes "...Hope all went well with the ride yesterday. Bill (Reagan) and I were a bit sad we were not able to participate. I was wondering if this ride is available as a permanent or a post-ride(if there is such a thing)? ..." -- No, unfortunately there is no such thing as a "post-ride make-up", but if anyone is interested in adopting the revised "Beyond Hope to New Hope" course as a permanent, it's up for grabs. Guy Harris completed yet another 200k on his fixie, and writes "....A good course to have in reserve for months and winters like this. A nice long training ride without much cue sheet reading. Thanks to Don for the scouting and for meeting up with us in Milford...."
Doug Haluza writes "... I would like to make the thumbs up vote on the route selection unanimous. Much better than riding on the L.I.E. Service Road, which is about all we can do back home on Long Island right now. This route was especially good for me bacause I was trying out my new Trek Speed Concept 7.0. .... I had only been able to do a few test rides on it with all the snow, so it was trial by fire. I liked that the route was an out and back, so if I had a problem, I could always turn around and still be on course. And I did appreciate being able to just keep my head down and hammer on the flat sections, which is usually an impossible dream on a PA brevet. ... I'm really glad I came. Thanks to Tom and crew for scouting out a ridable route to break the winter doldrums! ..."
Special thanks to volunteer Don Jagel, who completed a pre-ride checkout on Super Bowl Sunday and helped ensure that the course was safe for the rest of us. Don also swept the course through Milford, and manned the controle there. Special thanks also, to organizer Bill Olsen, for manning the finish controle. Bill's extensive ride report is below. Next up on March 5th, organizer Andrew Mead, with the help of George Metzler, will be running his Spring Forward 200k (a.k.a. Loop Around Lancaster). This is a fantastic course that really shows off the many quiet back roads through the Amish farmland. And spring really is just around the corner, which of course means that it's time to start getting those fleche teams together. Fourteen Riders started February 5th PA R-12 Brevet Beyond Hope to New Hope delayed until Saturday February 12th due to the ice storm the week before and all fourteen finished for a 100% completion rate. Due to the problems trying to schedule the February R-12 last year, Tom Rosenbauer, the PA RBA totally re-routed the previous Beyond Hope route to make it a relatively flat course on State and County roads with wide, paved shoulders that would be relatively free of any ice from the recent ice storms. The first section of the out-and-back course followed the Beaver Brook valley from Belvidere to Johnsonburg with the second section being an out-and-back route to New Hope along the Musconetcong and Delaware rivers. With the gentle rollers on the first leg, and the relatively light breeze, the group pretty much stayed together reaching the first controle as a group. After Johnsonburg, John Fuoco and George Metzler pulled out ahead leaving a second group of Jon Levitt, Shane Beake, Bill Fischer, Doug Haluza, Joel Flood, and Bill Olsen to work together against the headwinds that were starting to build. A little further back was Guy Harris on his fixie, first time brevet rider, John Capriotti, and Robert Dye, with Nigel Greene making up for lost time due to a late start. The second group managed to arrive at the Stewartsville controle just as the John and George were getting ready to leave so Jon chose to ride with them. The temperature had warmed up to around 25 deg, F from the starting temperature of 18 deg. and Jon wanted to ride a little faster to stay warmer than he would riding at the pace of the second group. Although the gaps between the groups opened up slightly as the day wore on, the heavy winds from the West (25-30mph with gusts to 40mph) kept the first two groups together. The weather forecast of temperatures reaching the mid 30's was finally reached around 1PM when the sun finally came out but by then the winds were at their full force. The river valley blocked most of the wind and once could hear the wind roaring in the trees at the top of the river valley. The wind shifted as it wound down the valleys to find its course and the majority of the tailwinds were felt on the route to New Hope. The return route was into the headwind but with the protection of the valley and the benefit of the being able to share the work of fighting the wind, the first two groups managed to finish the course in 8 to 9 hours. All riders managed to complete the ride in under 11 hours. Several riders commented that they might have preferred a couple of hills to the headwinds but they reserved offering this as an option to Tom knowing that he could have just as easily provided BOTH hills and headwinds. A highlight of the ride was the last 12 miles when the route headed directly north and what had been headwinds and quartering headwinds for the previous 35 miles were now quartering tailwinds. What a way to wrap up a beautiful, albeit somewhat cold and windy, February brevet. Thanks Tom for pulling together such a nice route and also thanks to Don Jagel who pre=rode the course the previous Sunday and volunteered to sweep the course. The goodies he had at the Milford controle really hit the spot. Thanks also to all of the businesses that served as controles along the way and especially the folks at the Belvidere diner who allowed us to park at their lot during the ride and also had such great menu offerings (and ample sized servings) at the pre-ride breakfast and post ride dinner. Hopefully we can continue to use this facility as a controle for future brevets. Thanks for a great first brevet; fantastic organizers and a great group of guys. I'm looking forward to riding with y'all again.